It has been years since the look of the timeline has changed in Talon, or many other Twitter apps, for that matter. There are some awesome clients out there to compete with my own, but the timeline is always familiar, no matter which app you prefer. Other than Talon's compact layout - which has never seen widespread adoption or usage - the app's timeline has remained relatively consistent since I introduced the "Fullscreen layout" in the classic version of the app, way back in 2014. There have been little tweaks, updates, and improvements around it, of course, but no structural changes. Today, I wanted to put out something a little different. 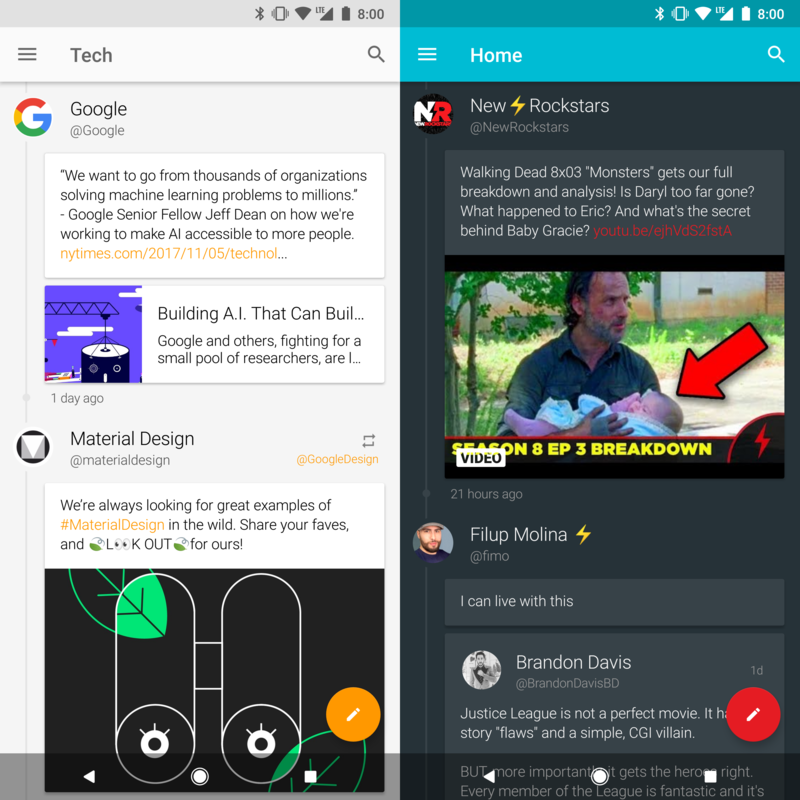 It isn't radically different by any means, but Talon has a new layout option: Timeline Style. This new design favors a cards based UI for the tweet content, with the metadata set back on an actual timeline. With phones continuing to get bigger and bigger, I don't think there could be a better time to introduce a layout like this. The new design does a good job of highlighting the "extra media" - such as images, videos, GIFs, quoted tweets, and web links - within tweets. The goal is to spread things out so you can focus on the content, rather than just jamming it down your throat. If you are someone that has a timeline filled with more than just text, try this style and see if you like it! Download Talon from the Play Store. Open up Settings -> App Style. Select Timeline Style Tweet Layout from the Tweet Style preference at the top. This new layout isn't going to be what everyone is looking for. If you liked the Compact Layout, chances are pretty high that you will hate this one. That's ok! The new layout just uses more space and is more spread out, when compared to the older options. If most of the tweets on your timeline are just text, then this layout doesn't do a very good job managing the space. However, the majority of people seem to love to see images, videos, quoted tweets, articles, and other media on their timelines. To coincide with this release, I wanted to give Talon's layouts and theme settings more visibility. When you open up the App Style section of settings, you will now see a preview of the layout you set up. I know this is a very welcome addition to the app - especially for new users - and works towards making the options more understandable and tangible. Talon's settings are powerful, and you can make the app completely your own. I will be the first to admit that its settings menu is much more complex than I like, though. It is difficult for both new users of the app, and old users, trying to find things that they want to tweak. The reason people seem to come to a third party Twitter app is the customization and feature additions, so it makes sense for the settings to be very extensive. This is definitely a step in the right direction for making those settings easier to understand, with a much quicker feedback cycle. Right now, I am not setting the new layout as the default. There is good reason that the timeline hasn't changed in years: the old way works well and looks great. This new layout is for those of you that are looking for something just a little different or unique. I have been using it and testing it myself for quite some time now. Jake gave me some inspiration, but I wasn't sure how I felt about it from the start. It grew on me pretty quickly though and is definitely my choice going forward. This new layout is for those of you that are looking for something a little different or unique. 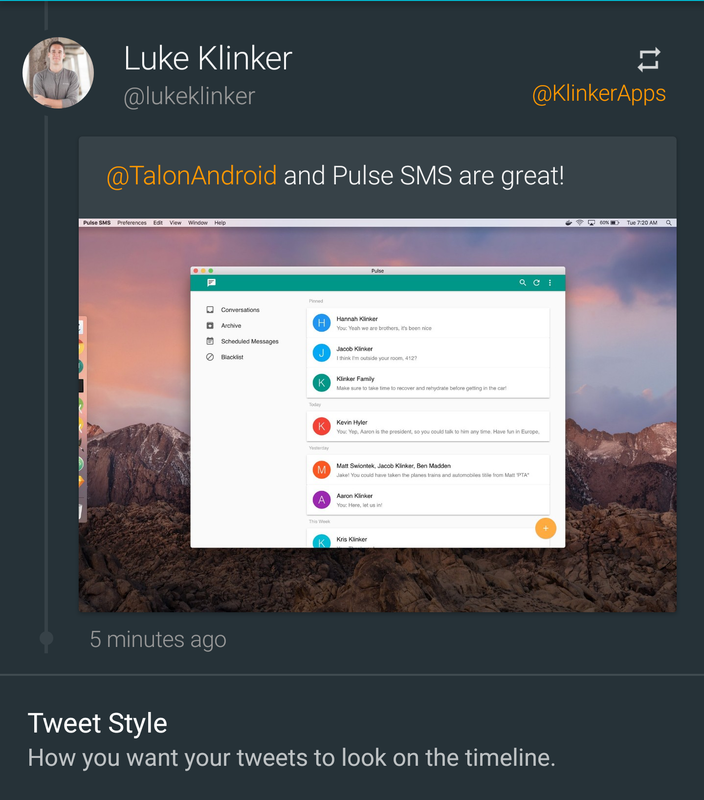 I have always done my best to give Talon features and a style that make it distinct from the original Twitter app, as well as it's other third party competitors. It can be a difficult goal, given user expectations and platform availability, but this is the next step in that goal. If you like the look, great, sound off in the comments! Don't like the new style? No problem, it isn't the default and isn't for everyone. Talon is full of options and tweaks to make it your own, try experimenting with some of those instead.